When people are in love with someone than Hugs and kisses are most special thing they share with each other. When people are in love they feel special and they will do anything for their partner, kisses are beautiful thing which people can share with their husband, wife or girlfriend, boy friend. 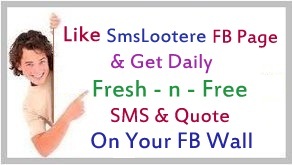 SmsLootere.com will always gives you best collection of SMS, and here we have another good category which all kisses lovers will love. So here we have special SMS collection of Kiss SMS in English, share this collection with your partners. It is not Them that You Kiss but My Soul. That They can’t See anything Wrong with Each Other..
Then We have a lot to Talk About. The Morning Due may Kiss the Grass, But You My Love, may Kiss My Lips! My Lips are Eager to Kiss You, and My Dreams in Night are Eager to Welcome You..
A Kiss is a Lovely Trick Designed by Nature to Stop Speech when Words become Superfluous..! In Your Arms I Feel so great the Warmth, the Love. Best Place is in that State Hold Me, Love Me, Hug Me, Kiss Me. Kiss of Gujarati girl ‘Do but don’t Tell to Any1’. Let Me Kiss and Hold You, Let Me Show You how I Feel, Let Me be there 4 You, Let Me Love You. Then You Changed My World with Just One Kiss. Every Time We say Good Bye, I wish We had One more Kiss! You Hugs & Kisses are the Only Sunshine I Need…! A Kiss is Purely Organic and Naturally Sweet. Is has Absolutely No Artificial Ingredients and it’s 100% Wholesome. And Here’s One for You.. Muah..!